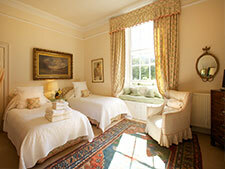 Downstairs there is a beautiful south facing bedroom in the west wing of the house that looks out onto the garden. 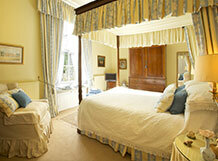 It has a king sized four poster bed dressed with generous swathes of blue and yellow chintz. 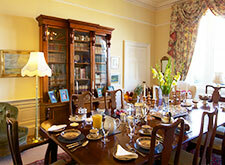 Carefully selected antiques and china give this room its own character. There is an attractive en suite bathroom, with bath/shower, basin and w.c.
On the first floor there is a lovely light and airy twin bedded room overlooking the garden and with a view of North Berwick Law. This bedroom is stylish and welcoming and has a very pretty, well appointed private bathroom with bath/shower, basin and w.c.
Also on the first floor is a large, elegantly decorated bedroom with king sized bed and an en suite shower room with walk in shower, basin and w.c. From this room there is a view out to sea . 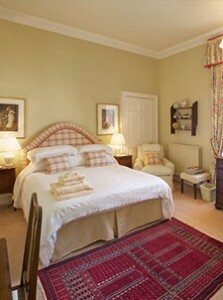 All the bedrooms have tea and coffee trays, flat screen televisions and hair driers. The dining room: breakfast is served in the dining room with its large mahogany table displaying family silver and surrounded by antiques and the Scott’s collection of Staffordshire china. Gwen will cook you a delicious breakfast and is happy to cater for special diets. 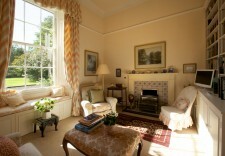 Sitting Room: situated in the west wing, south facing and looking over the garden, a perfect place for guest to relax. There is also a television in this room. 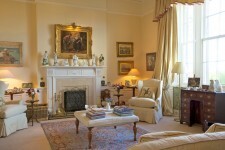 Drawing Room: large Adam style room with elegant features, open fire, lots more antiques. Another room for guests to make themselves at home.